Air Canada says local authorities in the Caribbean islands of Turks and Caicos have agreed to let the airline fly 95 stranded Canadian tourists to Toronto, after airport officials initially refused to allow those passengers to board a waiting plane Sunday. Air Canada says local authorities in Turks and Caicos have agreed to let the airline fly 95 stranded Canadian tourists to Toronto, after airport officials initially refused to allow those passengers to board a waiting plane Sunday. "The flight is now scheduled to leave later this afternoon," said Air Canada spokesperson Peter Fitzpatrick in an email. "As a result, 95 Canadians at the Air Canada Vacations and Club Med Properties will return to Toronto this evening." 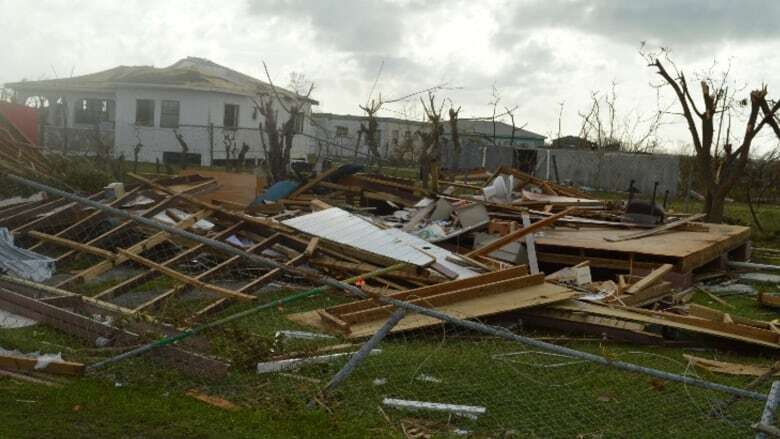 Authorities at Providenciales International Aerodrome in Turks and Caicos, an archipelago of islands southeast of the Bahamas, closed the main terminal to all but humanitarian flights on Sunday, Fitzpatrick explained. Air Canada was permitted to land a plane Sunday carrying 58 electrical workers on a relief mission, to help restore power to the island left devastated by Hurricane Irma. The Category 5 hurricane lashed the vacation hot spot with sustained winds of up to 280 km/h. "Our intention was to use the empty returning plane to carry home [the stranded] Canadians," Fitzpatrick said. "However, airport and civil aviation authorities in Turks and Caicos refused to allow Air Canada to board these passengers despite earlier information such a charter flight would be permitted." The return flight had originally been set to depart Turks and Caicos at 4:30 p.m. ET Sunday. One Air Canada passenger, Quebecer Geneviève Couët, said everyone at the Club Med resort where she'd been vacationing since Sept. 3 was shouting and clapping when they got news their flight would be allowed to depart Monday afternoon. "I'm relieved," Couët said, adding, "I'll believe it when I'm sitting on the plane." "I feel fantastic," said fellow Quebecer Johanne Perron. "We haven't slept all week. We're very, very exhausted, so, of course, we feel great, going home." Perron first spoke to CBC News Sunday after being blocked from boarding Sunday's flight, with no explanation from Air Canada nor from Canadian government authorities. "Are we being held against our will here?" Perron asked at that time, after being bused back from the airport to the resort. "We are stuck on this island until when?" She said conditions have become increasingly spartan at the resort — the site is running on generator power, there is no air conditioning, and it's "really, really uncomfortable." "I just hope all the other travellers can get repatriated," Perron said, as she prepared to head back to the airport. She said there are Canadian resort guests who'd flown to Turks and Caicos on WestJet who were still awaiting word on when they will be able to get off the island, as they've been told WestJet doesn't yet have clearance to fly in to collect its passengers. Federal Transport Minister Marc Garneau confirmed at a news conference in Ottawa early Monday afternoon that WestJet would be flying into both Turks and Caicos and St. Martin later in the day. Another Canadian, Michael Rhude, said he'd been told senior officials at Air Canada were snubbed by local authorities in Turks and Caicos when attempts were made to resolve the impasse over the waiting charter plane. "I'm also told Club Med tried to get a hold of the minister in charge here, and that the minister wasn't taking phone calls." Rhude, a retired lawyer from Toronto, said he was in touch with Global Affairs Canada officials overnight Sunday, and they told him they were working on diplomatic options. "They were distressed that large numbers of Canadians were being held here," he said. "I expect a lot of the credit goes to those efforts." Across the Caribbean and southwestern U.S., some 9,000 Canadians have registered with Global Affairs Canada to say they are in Irma's path. Assistance has been requested by some 350 Canadians, with most requesting help to get home from areas hit by the storm. On Sunday, Rhude told CBC News he was in danger of running out of the medication he needs to walk. "I brought enough medication for my arthritis for the trip I intended to take. I've got about four days extra with me. If I run out of those, I won't be able to walk back onto that airplane," he said. He said without air conditioning, temperatures at the hotel were hovering around 45 degrees at night. "We'll all be pleased to get home and take advantage of our respective air conditioners and clothes washers."